One of the first label-free, real-time detection principles offering information on pathway-specific activation of GPCRs was introduced with the Cytosensor™ microphysiometer (Molecular Devices, Inc., Sunnyvale, CA). The Cytosensor uses silicon semiconductors to measure extracellular acidification as a consequence of increased cell metabolism and secretion of acid metabolites due to GPCR activation. Importantly, the microphysiometer was successfully used to monitor activation of many different GPCR protein family members, and the assay principle appears to be independent of a particular signaling pathway. 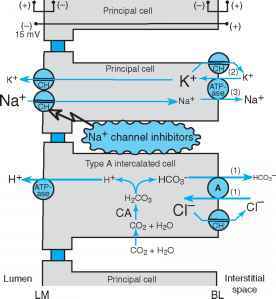 Remarkably, in some cases, the extracellular acidification kinetics provided some information on the particular G protein pathway involved. Thus, for a given cellular background, the GPCR-induced responses differed in terms of onset and persistence of the extracellular acidification depending on the different signaling pathways. Gaq coupling induced a rapid, transient, and sharp acidification response in Chinese hamster ovary (CHO) cells, exemplified in a study that used the neurokinin receptor subtype 3 (NK. )-selective agonist senktide in cells expressing recombinant NK3 receptors. In this study, the senktide-induced effects were inhibited by the protein kinase C (PKC) inhibitor staurosporine and by depletion of Ca2+ stores with thapsigargin. However, the agonist-induced effects were insensitive to both cholera toxin and pertussis toxin treatment, suggesting a phospholipase C (PLC)-mediated Ca2+ response pathway as a consequence of Gaq protein coupling - 20] . In contrast, CHO cells expressing the recombinant human corticotropin-releasing factor receptor subtype 2 (CRF-) receptor, which is a prototypical Gas protein-coupled GPCR, responded to CRF stimulation with an increase in acidification rate that was characterized by a prolonged monophasic response that was broader than a typical Gaq trace, reaching a maximum at 10-12 min after ligand stimulation and returning slowly to baseline . Gai coupling induced an extracellular acidification rate change in CHO cells that was reminiscent of a Gas coupling reaching a maximum between 1 and 6 min after ligand stimulation. However, the time to reach the response peak varied between receptor types and cell clones, and therefore, pertussis toxin treatment was used to distinguish Ga s - mediated from Ga i - mediated coupling  . With the Cytosensor, a significant number of GPCR ligands were functionally characterized, including structure-function relationships, dissection of signaling pathways using pathway-specific inhibitors and receptor desensitiza-tion, and successful identification of partial agonists and even inverse agonists . Although the potencies of GPCR agonists did not always correlate between other GPCR assay methods and microphysiometer assays, the rank order of compound potencies was usually preserved. It is also important to remember that the GPCR-induced extracellular acidification rate may be modulated or influenced by the expression levels of effector proteins in a particular cellular background, and, if synthetic molecules are investigated, there might be an influence on the cell metabolism due to physicochemical properties of the compound and through unknown molecular interactions. Furthermore, the G protein-specific signatures can be influenced by the desen-sitization kinetics of the GPCR upon ligand stimulation, and this must be considered in structure-activity studies using either peptidic or synthetic small molecules that display partial agonism. In these cases, the signature may not be very indicative of the coupling mechanism or potency, but it may instead indicate the different propensities of the molecules to desensitize a target GPCR upon stimulation . Despite autosampling capabilities, the Cytosensor is a very low-throughput machine (either 4 or 8 wells), and it features a complex mechanical design involving peristaltic pumps and plungers. Furthermore, the cell growth medium has to be exchanged for a low-buffering-capacity medium to allow accurate measurements, which might explain the scarce information on the use of non-recombinant or primary cells with the Cytosensor. Together, these issues may have contributed to the discontinuation of this product by the manufacturer. The recently introduced XF24 analyzer (Seahorse Biosciences, North Billerica, MA) now offers improved throughput (24-well and 96-well) and combines acidification and oxygen consumption measurements in a single assay well. Oxygen levels and pH are measured by optical biosensors that are placed approximately 300 |im above the cells. Measurements are made by monitoring changes in the surrounding media in as little as 1.5min and can be extended over a period of days. As oxygen consumption is a direct consequence of mito-chondrial activity, whereas extracellular acidification is predominantly a consequence of increased glycolysis, there is a potential advantage of using both parameters in one assay, as this may lead to novel and interesting insights of GPCR activity on cell metabolism, and this could help to unravel new mechanisms of GPCR signaling. Until now, only one published study demonstrates the applicability of the XF24 analyzer to GPCR pharmacology in primary cells  . Feline cardio-myocytes, which naturally express muscarinic receptors, were stimulated with 1 |M of carbachol to induce a time-dependent rise in acidification. It remains to be seen if the XF24 analyzer will revive the microphysiometry assay principle in the GPCR field, although this methodology will clearly help to identify potentially cytotoxic molecules and may reveal metabolic side effects of an exploratory compound. Furthermore, as a significant number of targets, including GPCRs, are currently explored to discover novel drugs in metabolic disease, this technology may help to optimize certain compounds in disease-relevant cells.